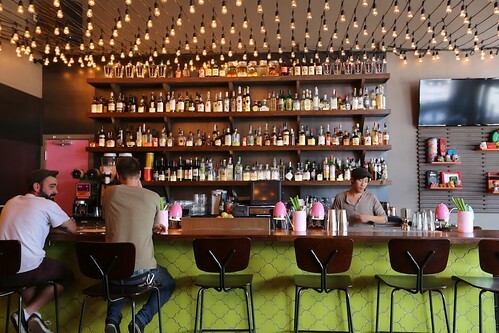 You could call the Mission District in San Francisco psychedelic. Home to the over 600 murals, the Mission is a canvas for epically large and intensely colorful paintings splashed all over the sides of its buildings. Add in a few spots known for drug exchanges and a newer reputation for hipster play, and it's no wonder everyone is seeing bright spots. Chino is a playful addition to that colorful scene. 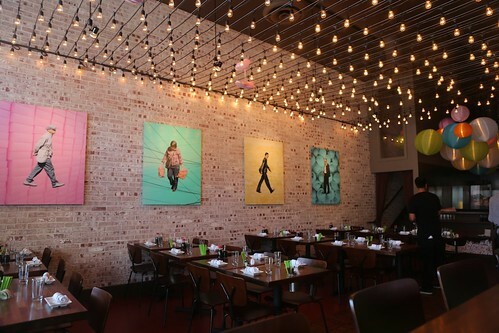 Owned by the same team as Tacolicious, Chino offers a take on Asian-inspired food. Fuchsia Dunlop fans and Yelpers, put your fingers down now—this is not an attempt on authentic cuisine. 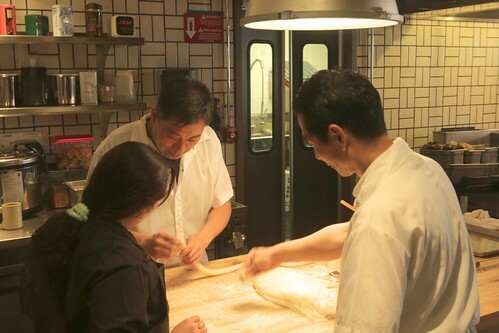 Instead, you'll find a punchy flavors from favorite Asian dishes from China, Japan, Korea, and the Philippines—stuff like Xiao long bao (soup dumplings), "Chinese-ish pork ribblets," lumpia, "Korean-American rice cakes," and more. The restaurant decor is fun and zany, full of Christmas lights, strangely hypnotic pictures of senior Asian people against neon backgrounds, exposed brick, and throwback toys from the 90s. 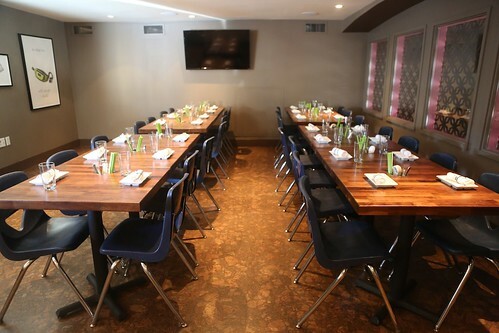 The space is filled with mostly dinner tables, but snackers and drinkers can also sit at the prominent bar in the front. 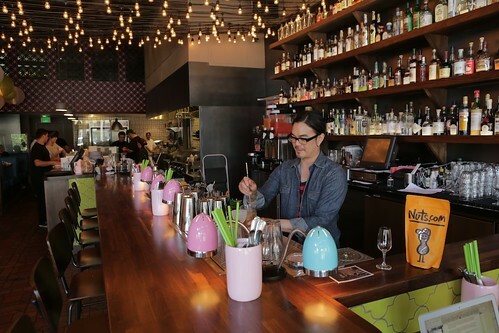 An upstairs bar pumps out additional drinks for the restaurant, and the additional seating on the second floor can also serve as a place for a private party. 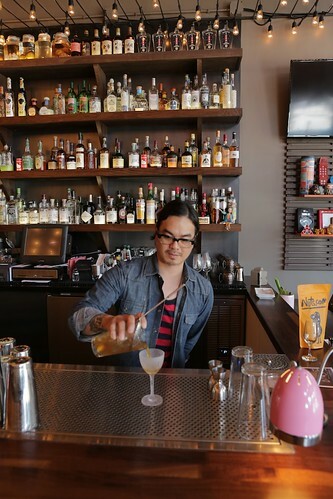 Danny Louie is the force behind the equally zany cocktail menu. 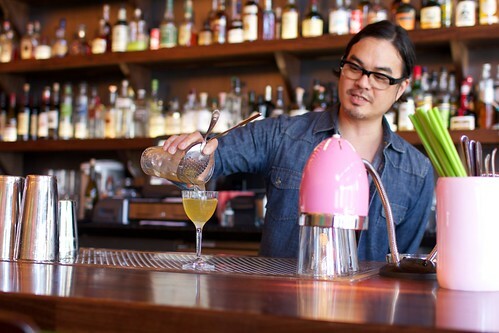 Trained in the cocktail classics at his former post Alembic, Danny makes several plays on old conventions in these inventive drinks without making the flavors too cloying or tart. 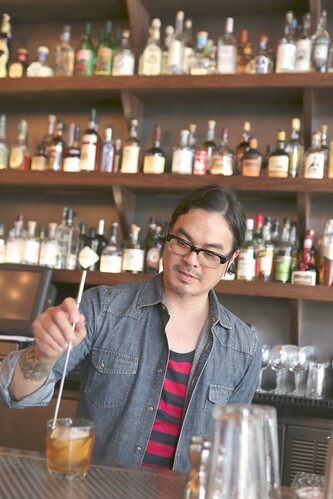 Like the food, Danny's cocktails are inspired by the Asian theme and make use of a lot of tea as a featured ingredient. 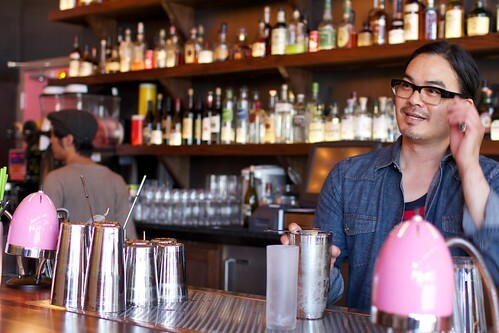 The cocktails may not look or sound serious but they are carefully crafted. 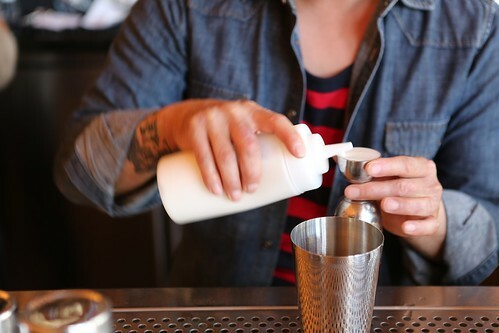 Danny uses high quality spirit, juices they squeeze themselves, and syrups they make in house. 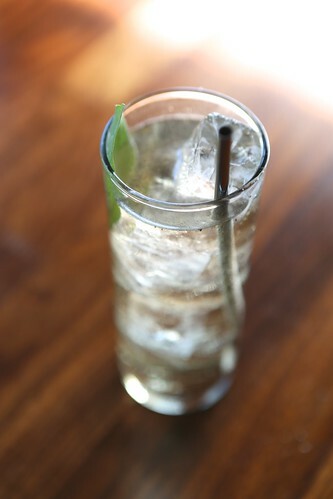 The cold, refreshing drink is a classic Charles H Baker cocktail that many cocktail nerds will recognize. 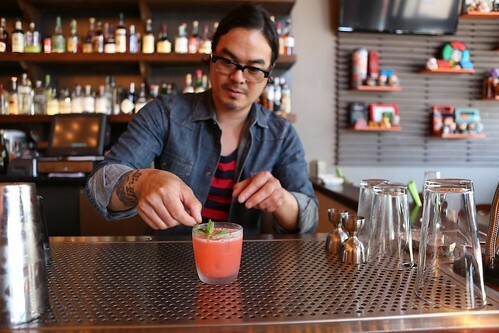 Danny tweaks the original recipe using fresh pressed ginger to create a fruity and slight effervescent drink. 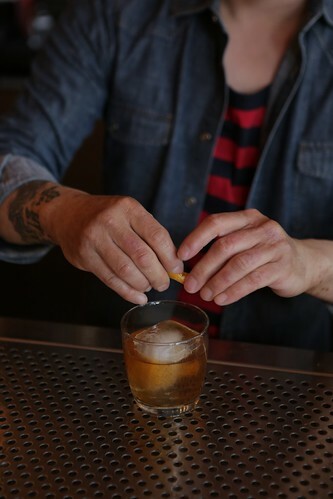 This twist on the most classic of all cocktails uses James E. Pepper rye and swaps in housemade cola syrup (a cross between cola and root beer) instead of sugar. Thankfully, the cola syrup doesn't make the drink to sweet. 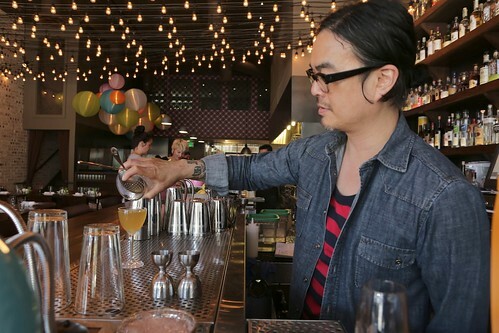 Danny stirs it down to the perfect dilution, and the drink is well balanced. 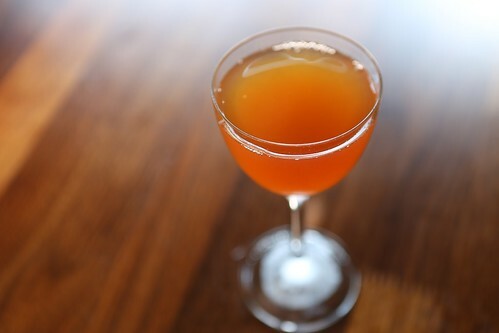 Laphroaig 10 year, lapsang souchong syrup, Cardamaro, and peach vinegar make up this drink. Lapsang souchong is a famously smokey Chinese tea (so smokey, I once got scolded at a Chinese tea shop for buying it because the store woman thought it was too smokey to be lady like—but whatever! I like it) which pairs brilliantly with the smokey Laphroaig. 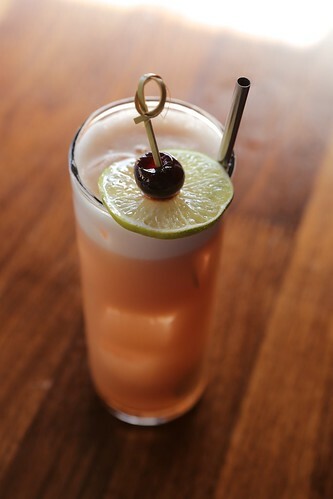 The peach and cardamaro round out the drink and make it pleasant and approachable for anyone to drink—girl or boy! 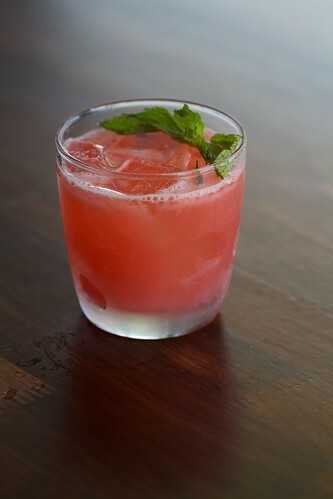 Made of Anchor Hop Head Vodka, Zirbenz Sone Pine liqueur, and strawberry shrub. The name is appropriate because it tastes through and through like strawberry. Refreshing on a warm day. 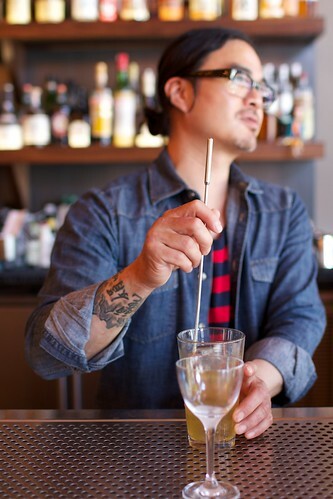 Danny uses Beckerovka (a spicy Czech spirit that tastes like cinnamon, clove, and Christmas), Sutton Vermouth (made locally in San Francisco's Dogpatch), cold chamomile tea, and vinegary apple shrub. 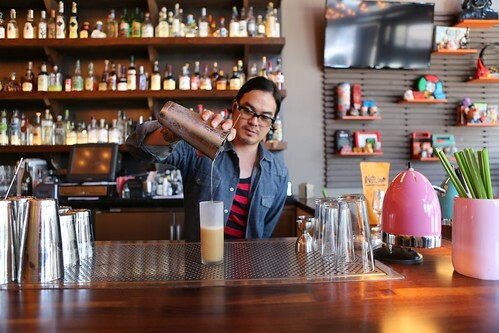 It's a bright and tasty drink that tastes of a crisp fall day. It tastes like a refreshed, cold hot toddy. 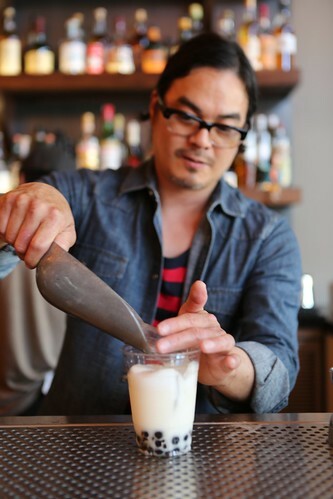 Tell us that even one of these ingredients is not surprising: Baijiu (roughly translated in Chinese as run away—OK, so actually it means rice liquor. 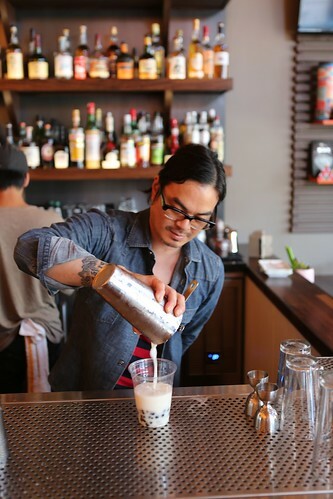 I had been warned about this coarse spirit many times while traveling in China, but the Baojing label that Danny uses is actually a delicate expression of it and tastes almost like an Asian pear), almond milk, passion fruit, and Lipton Tea. 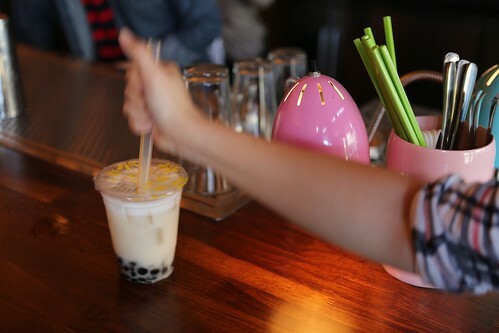 The drink is served long and is reminiscent of many tiki drinks, but much more nuanced, largely from the almond milk. Frothy, light, and delicious. 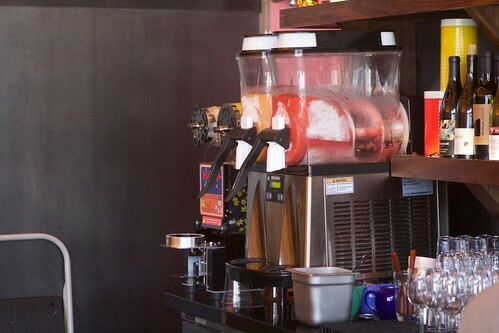 Yes, Danny brought in a slushie machine that mixes up two spiked flavors seasonally. 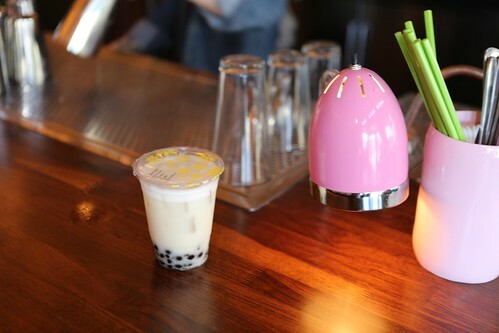 They are served in traditional Asian glory—that is, over high quality boba and using plastic cups sealed by a special sealing machine, which you can see to the left of the machine. 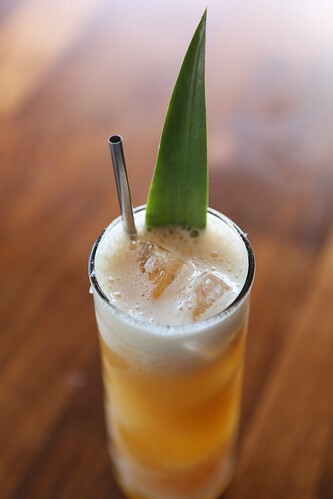 On this day, there was Boba Fett (vodka, apple, ginger, thai basil, and lemon) and Dr. J (rum, orange, vanilla, and cream), which Danny calls an orange julius for big kids. 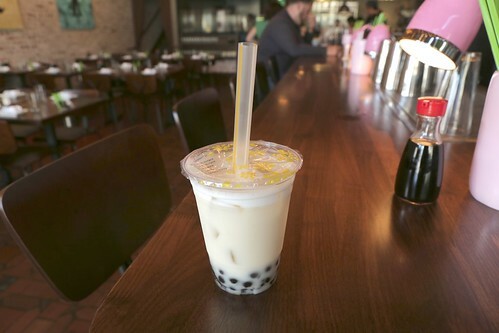 Sometimes Danny will also make a flavor without the machine, like this creamy variation made of green tea, pineapple, cola syrup, lime juice, denizen rum, house made sweetened coconut milk, and of course boba from Nuts.com. 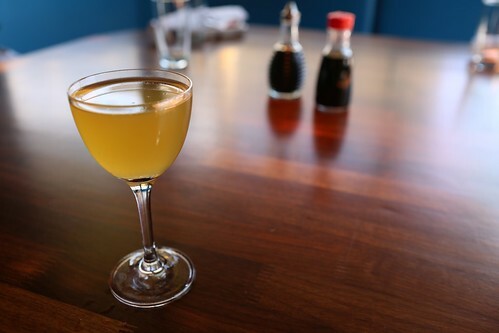 Made of Aviation gin, white grape, green tea, and Szechuan pepper. It's easy to drink with just a little pepper at the back. 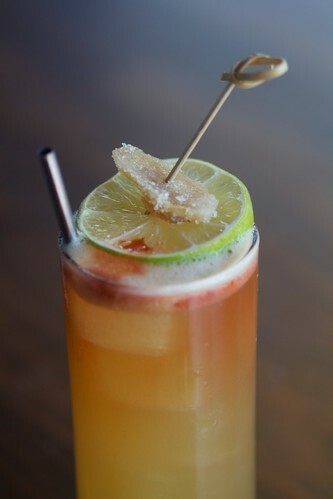 Like some other tiki drinks, there is no clear agreement on the recipe for the Singapore Sling, but Danny tweaks Dale Degroff's recipe and the famous Raffle hotel's to create a well-balanced blend of gin, benedictine, cherry heering, citrus, and bitters. For more pictures of Chino, check out our album here. 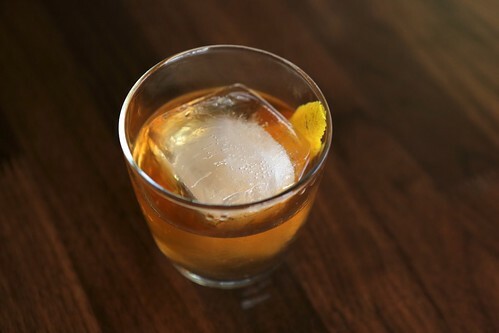 An old-fashioned is a classic that has been around for generations. As long as there is a designated driver, they all sound good.